WEIGHT OFF MAX: Razberi-K® Raspberry Ketone, Capsule (Kosher & Halal certified gelatin), Silica, and Magnesium Stearate. FORSKOLIN: Capsule (Kosher & Halal certified gelatin), Magnesium stearate, Maltodextrin, and Silicon dioxide. Provides for healthy glucose metabolism. Helps the body to metabolize carbohydrates and fats. have high blood pressure, glaucoma, and/or detrusor instability (overactive bladder syndrome), a liver disorder, a gallbladder disease, an intestinal obstruction, an iron deficiency or develop symptoms of liver trouble (such as abdominal pain, dark urine or jaundice). Consumption with natural health products (e.g. bitter orange extract, synephrine, octopamine, ephedra) or other drugs (e.g. ephedrine) which increase blood pressure is not recommended. Consumption with other caffeine-containing products (e.g. medications, coffee, tea, colas, cocoa, guarana, maté) is not recommended. If you are pregnant, do not use this product. 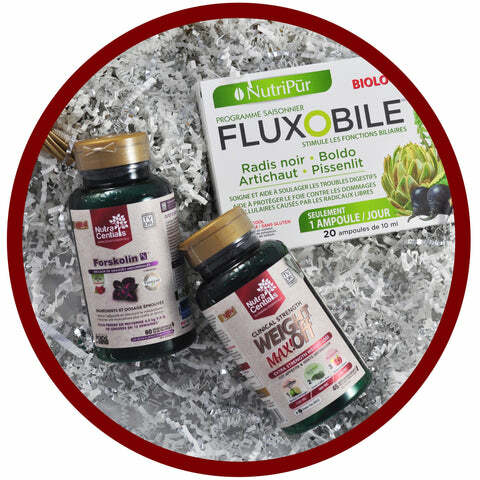 FLUXOBILE: 1 ampoule a day for 20 days.